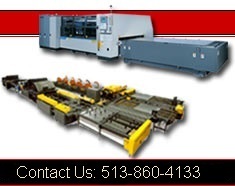 Plasma Cutting | Precision Plasma cutting machines | Cincinnati Precision Machinery, Inc. 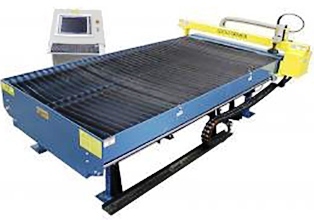 The Cutter II cutting system was introduced to the market in 2006 as the latest model in the Advance Cutting Systems product line. 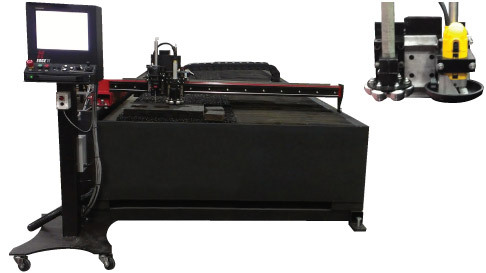 The Cutter II is a state of the art Computer Numerically Controlled (CNC) Cutting System designed to use a plasma-cutting torch to cut out geometrical shapes and parametrically programmed HVAC (Duct Work) fittings. The fittings are programmed in the office using Profile Master PM-2000 Duct-CAM (Computer Aided Manufacturing) software; the parts are then nested on a sheet of metal to minimize material waste and are then cut out at high speed with the plasma torch. 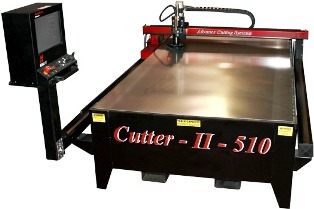 The Cutter-II is offered in 5' x 10' , 5' x 20' or 6' x 12' models. As standard features, the Cutter -II includes the Hypertherm Ti Touch Screen Color Graphic Control, Hypertherm Powermax 1000 Plasma, Floating Head, Dell Office Computer, Dell Color Laser Printer, Down-draft Cutting Table and On-site Installation and Training. PM-2000 Duct-CAM software includes SMACNA classifications and a fitting library of over 300 Rectangular Fittings, Round Fittings, Oval Fittings, Square to Round Fittings, Transitions, Multi-tap Fittings and more. PM-2000 also segments oversize fittings and produces management reports and tracking labels. PM-2000 can also be integrated with CAD-Duct (Computer Aided Drafting) and EST-Duct HVAC Estimating software offering the only “Totally Integrated Solution” to the HVAC contractor. Technical Sales International (TSI) is the supplier of CAD-Duct and EST Duct for North America. Cut Insulation, Duct Board, Plastic, Rubber and More! Vulcan is . . . Simply the best worldwide. The Plus is the benchmark in plasma cutting systems – now featuring the new “Flex-Ability” technology. A superior product brand because it has earned the reputation for unrivaled quality, performance and value. Renowned for its design and CAD to CAM solution, the VulcanPlus outperforms other HVAC Plasma cutting systems..state-of-the-art in every detail and component. 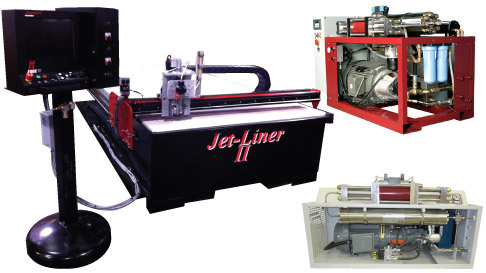 Through the years, Lockformer’s steady stream of innovations provide the latest trends in HVAC sheet metal cutting and these influences significantly set us apart. customary daily service rates plus travel & living expenses.